Masseria captivates me the moment I step through the gate and into the courtyard. 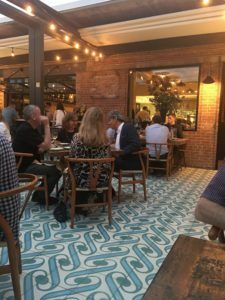 This beautifully appointed spot created by chef/owner Nick Stefanelli is designed to transport visitors to the coast of Italy, which is an admirable feat considering its location on a quiet street of warehouses behind Union Market in DC. And while rustic brick and wood decor is nothing new in restaurant design, it’s breathtaking here with elegant touches of leather and marble that provide a distinct Italian flair. 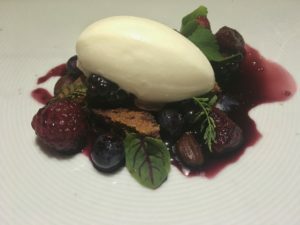 Stefanelli, who most recently served as Executive Chef at Bibiana, has created an Italian-inspired tasting menu that is luxurious, modern, and innovative. I’m grateful that we arrive early, in time to enjoy a cocktail at the bar. Bar Manager Julien-Perre Bourgon is pouring over an array of intriguing concoctions. “We Did it All for Don” is an effervescent blend of Smith & Cross Rum, Fino Sherry, lime, cinnamon, passion fruit, and nutmeg. We are seated on the outdoor patio, with its blue tiled floor evoking the Mediterranean sea. On this particular evening there is a cool summer breeze, which couldn’t be more suited to the setting. An overhead awning is retractable, depending on the weather. At one point a brief drizzle sets it temporarily in motion. The price fixed menu features three courses for $68; four courses for $75, or five courses for $85. The difference is not so much in the quantity of food as it is the variety that comes with more courses, says our server. Variety wins. 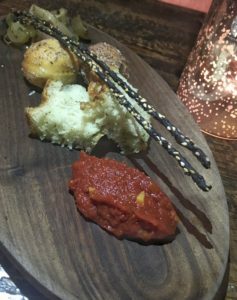 The meal commences with a handsome breadboard featuring thin squid ink bread sticks coated with sesame seeds, airy donuts, a thick tomato dipping sauce, and pickled vegetables. 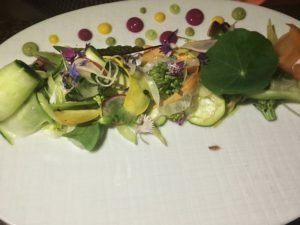 Spring vegetable salad is a work of art which acquires much of its beauty directly from the earth. Dots of colorful sauces are a tasteful addition. 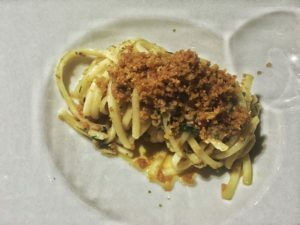 Masseria spicy XO sauce embraces a satisfying plate of chewy linguine. It would be perfection with a smidge more fire. 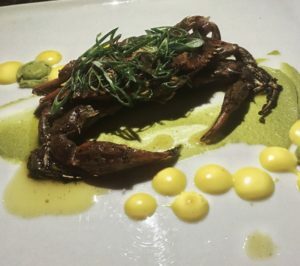 Softshell crab rests on an artichoke sauce accented with dots of saffron puree. The spice comes through on this dish, and chopped scallions provide additional oomph. 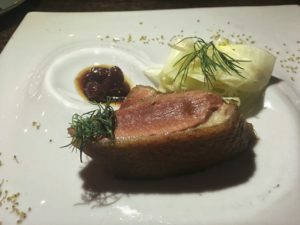 A crispy serving of dry aged Muscovy duck is fairly simple. It’s sweetened with a side of macerated strawberries and shaved fennel with dill. This skillful dish steals the show. My husband lauds the flavor of Chesapeake Bay rockfish with a red wine sauce, even though he finds it slightly dry. Slight imperfections in the meal are evident, but its not enough to detract from the overall experience. A pre-dessert of poached black fig with strawberry chamomile sorbet provides a deliciously welcome opportunity to prolong the evening. While Masseria gives you an option to choose from various sections of the menu for your tasting, the one course that is mandatory is dessert. 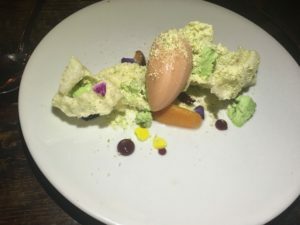 Why would anyone want to skip Sicilian pistachio semifreddo with stonefruit macedonia, peach and chamomile sorbetti, and pistachio crisp? Pair it with a cup of coffee, sit back and relax, and imagine that you’re in Italy. My fantasy is facilitated by our Italian-accented server. There’s something about Masseria that I find irresistible. 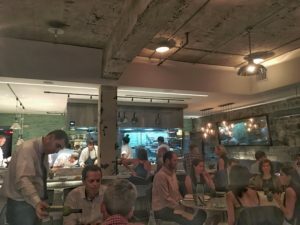 Bravo to Chef Stefanelli for creating an impressive metamorphoses that has both charm and pizzazz.